Being the namesake of the school, it is important that students, parents, staff and guests fully understand who Amadou Hampaté Bâ was and why the school was named in honour of his legacy. 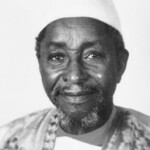 Amadou Hampâté Bâ was born in 1900 or 1901 to an aristocratic Fula family in Bandiagara, Mali. Writer, historian, ethnographer, poet and story teller, he is one of the greatest specialists of Peul culture and African traditions. He was trained in a francophone primary school and became a junior clerk in colonial administration. At the same time he completed his Muslim upbringing by following the teachings of Tierno Bokar, a Muslim Sufi sage preaching a very open-minded and tolerant Islam. In the 1960s, Amadou Hampaté Bâ became Director of the new Malian Institute for Research in Human Sciences and an Ambassador to UNESCO. He is credited with coining the now famous phrase: ‘the death of an old man is like the burning of a library’ in praise of both old age and oral tradition. His work as a guardian of oral tradition became well known, but he was at the same time, a Muslim scholar trying to bridge the gap between cultures and civilizations. His novel L’Etrange destin de Wangrin (The Fortunes of Wangrin), a masterpiece of picaresque humour, won the grand prix littéraire d’Afrique Noire in 1973. In his later years he retired to Abidjan, never ceasing to work towards establishing a genuine dialogue between his Muslim faith and other world religions. 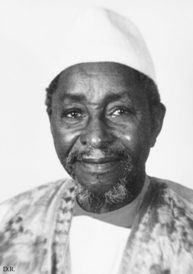 Amadou Hampaté Bâ passed away on the 15th of May 1991.